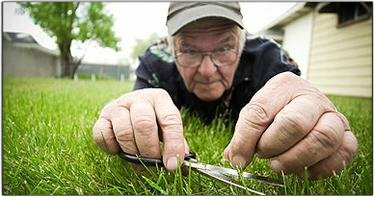 Most of the time I’m pretty focused on getting things done. Most of the time. But right now, I’m finding myself infinitely distracted. First, there’s all the “grey” things I could be doing, work that’s justifiably related to things that matter. Social media to build connections for my writing. Research on the best small business checking account. Setting up a PO box for my business. Reading just one more book full of insights on how I can be a better writer, or blogger, or be more effective with the tools I use. I can do all these things. Heck, I can do them all at once. But I’m finding enormous pressure and resistance around the one thing I really want to be doing right now. Taking the final steps on publishing this eBook. It’s so close. And yet I can so easily do a hundred other things than this. Why? I care a great deal about every detail. I want the things that I do to be excellent. There’s something good about that, I think. Beautiful things inspire people. As an artist, it’s far more interesting for me to engage in crafting something elegant. The world is better when people care about excellence. But there’s something more, something darker. Perfectionism is a shield that hides fear of failure. If something were truly perfect, it couldn’t fail, right? At least that’s the myth. And so, I’ve known incredibly talented musicians who spend years tweaking their songs, rather than releasing them. I’ve known writers who will write and re-write and re-write, rather than let someone else read their work. This isn’t just a failure among artists. I know people in offices who pour the same effort and intensity into their presentations and spread-sheets and reports. All this happens at a loss. The musician loses the opportunity to see if his music resonates with people and then grow from that. The writer never moves on to the next novel because the first one never comes out. And the office worker hates their job because of the weight of the need to perform perfectly. Fear of failure is the real enemy, and perfectionism is its voice. This fear results in paralysis or, in my case, eternal distraction. If the book never comes out, then I’ll never be critiqued on my concept, or my theology, or my writing style, or my font choice, or the hat I’m wearing in my picture. That feels so much safer. It is safer. But it’s not life. Steve Job’s Quote, rendered by Andrew Power (Go buy a print! ), with a great article by Benjamin Starr. 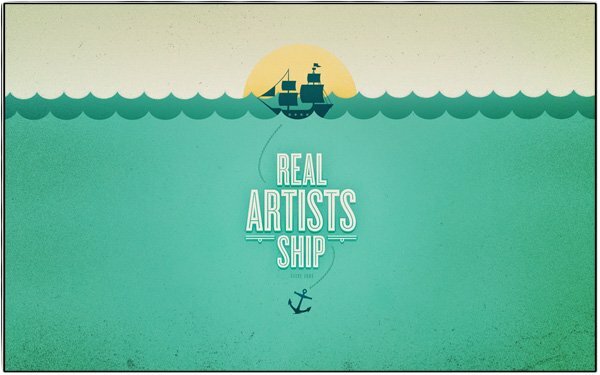 Steve Jobs is famously credited as saying “Real artists ship.” They do the thing they say they do. They write, or sing, or dance, or analyze spreadsheets, not in their bedroom, but out in the world where it matters. Maybe you shouldn’t be allowed to call yourself a thing–a writer, or dancer, or accountant–until you’ve done it in a place and time where your failure would matter, where others could judge your performance, where you had to push through the fear of being rejected and do the thing you love anyway, out in public where everyone can see. My heart says, “I will be a writer, if I can just write exceptionally well.” But I don’t think that’s true. The truth is that I am a writer when I push through the fear of rejection and failure and share my writing with you. I’ve had enough conversations with other people to know that this fear is not special to me. It’s near-universal. Since I believe that you were created by God with a good and beautiful purpose, and that your life will be so much more full and fulfilling as you begin to discover and live that purpose out, I also believe that this fear is getting in the way of God’s plans for you. That’s one of the benefits of grace. If you know you’re already accepted for who you are, if you understand that God is at work in these hard places in your life, if you believe that your deepest failures have already been forgiven, then fear of failure can be seen for the empty phantom it really is. 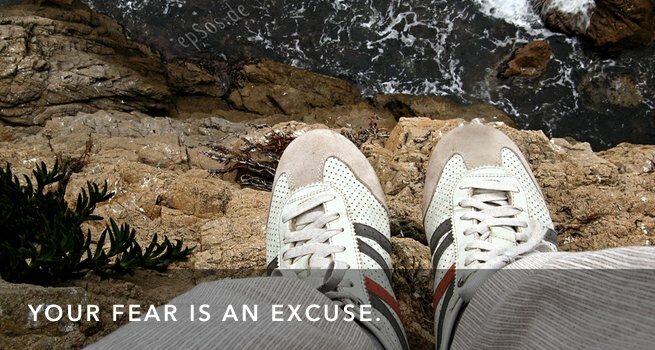 What thing are you not doing because you’re afraid? It’s time to push through. If you’ve been made to write or paint or dance, if you were wired up to plan events or organize people or keep track of numbers, then do it. Don’t fear failure; failure can’t kill you. In fact, it’s the best place for you to learn. Fear not doing the thing you love, because that’s what will really numb your soul. What’s your project that you need to push into?